Pop Chart Lab makes some impressive taxonomy charts. Following last year's complete taxonomy of college sports mascots, the poster company has turned to everyone's favorite subject—alcohol—for its latest mind-boggling creation: The Magnificent Multitude of Beer. Click over to the site to zoom in and scroll around the comprehensive chart. 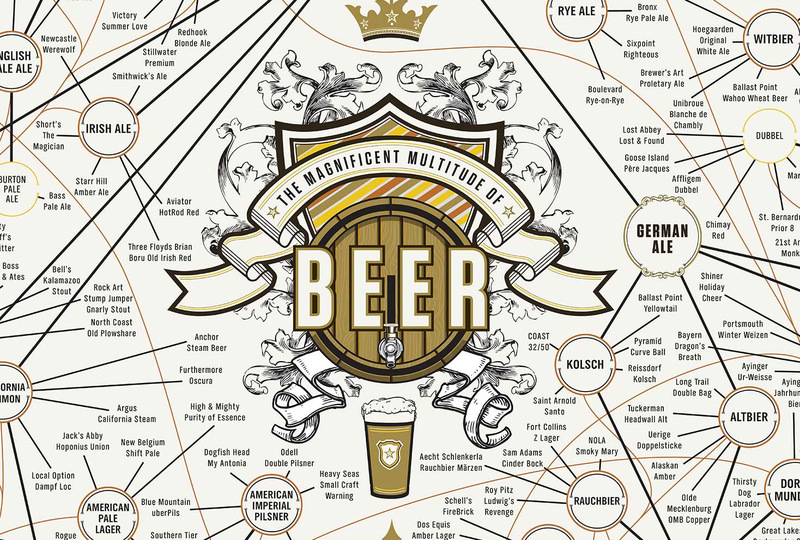 It's organized by varieties of beer, with examples of brands for each type. Says the company: "This wall map is the most complete charting of beer ever, breaking down ales and lagers into over 100 delicious styles from hoppy IPAs to fruity lambics, and including over 500 individual beers as notable examples of each style as well as glassware recommendations." The 60-by-40-inch poster can be yours for $76.